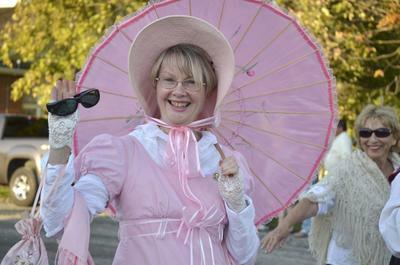 Brian sent along these pictures from the Huntsville Fall Fair. Lots of people were out, kids of all ages, as they say! The mid-way is always a happening place. Produce exhibits are also popular - those are our apples, front and centre, sporting red ribbons. These two apple trees at Bondi, one a summer crab, one a winter crab, are undefeated in their respective classes at the Fair over the years. And these are our potatoes -- with the blue ribbon, in the front row. Red Chieftains -- that's the variety. Tasty, that's the word! The Wellington Waterloo Club was here on the weekend. They got gorgeous weather and spent most of the days out with canoes. Early on Sunday morning, some of them headed to the dock for an early morning swim. In the mist. There is magic in the Muskoka lakes at any time of year, but perhaps never more than early in the morning in the autumn mist. The loons have been in the bay all week, calling in the night. Labels: Wellington Waterloo Canoe Club. Bondi Village Resort. 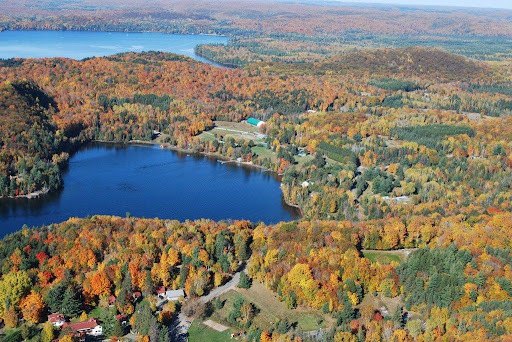 Lake of Bays. That's the great thing about Fairs. You take in the best produce you have at the time, and help to "make a show", as my Dad would have said. We've exhibited at the local Fair for years. This year our produce came home with more ribbons -- first place for both summer and winter crabapples, third for the largest sunflower head, and a second for potatoes. Nancy had friends and students showing in the Horse Show section. Her friend and vet, Norma de Rose, even tried her hand at driving a pony in the pleasure driving class. Other guests that are currently here for some Algonquin Hiking also made a splash at their own local fair -- Anne won for both her chili and her relish recipes at the Doon Fall Fair. Fall fairs have something for everyone, and are a wonderful country tradition. You should always seize the chance to visit them. Really... you'd be amazed at what you'll find! Just beware the mid-way -- Byron - Norma's son -- who is a lethal player on his hockey, lacrosse and baseball teams, just couldn't seem to stop winning stuffed animals in the pitch and toss. Labels: fall fairs ontario. Lake of Bays. Huntsville Fair. Brian, Mike and Dave took advantage of this spectacular autumn day. Hooking up the fishing boat, they headed into Algonquin to fish Lake Opeongo. Fishing is serious business. Requires a lot of attention to detail, and concentration. David demonstrates the approved technique. Part way through the day, a mourning cloak butterfly dropped in to visit, landing on Brian's hands. It was quite happy to have a bit of rest, out there in the middle of Algonquin's largest lake. They stopped for a shore lunch, and David and Mike picked out a campsite for a future adventure. Algonquin has that affect on people. It is a stunningly beautiful place, no matter what season of the year. Right now, with the colour painting the hills, it is breath-taking. Not nearly so breath-taking, however, as the lake trout Brian landed. Dinner! Labels: Lake Opeongo. Bondi Village. Fishing in Algonquin Park. I got to attend -- cheering for Jacquie, nominated for the outstanding work she does with the Andrew Daniels Fish Stewardship Program helping to rehabilitate fish habitat on the Lake of Bays. We all got to cheer Al Sinclair, for the incredible amount of years he has put into the Muskoka Field Naturalists; and long time friend Ruth Newell, for being Ruth, for saying that when you see something that needs to be done, you just step up and do it. There was a wonderful slate of nominees, all more than deserving. The hotel did a terrific job with the dinner. But the icing on the cake was the MC for the evening, Marc Jordan. Now, if you've never had the chance to see him perform, I'm telling you that you should be adding him to your Life List. A long time cottager on the Lake of Bays, and husband to singer Amy Skye, Marc made the evening sparkle. From his humourous introduction, through the all-too-short-set of some of his songs to his comments during the awards, he was a delight. 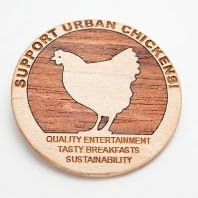 But if he ever changes that policy, we've got several fine laying hens over here that would really look good with his name scrawled across their wings. And we'd be more than happy to welcome him to Bondi. Thanks for the evening, and special thanks to Marc for making it truly memorable. Labels: Marc Jordan. Muskoka Awards. Andrew Daniels Fish Stewardship Program. Bondi Village. Lake of Bays. Muskoka. It's the end of a hectic summer season, and to say Thanks to all their partners, the Muskoka Tourism Marketing Association invited us all for a cruise on the S.S. Wenonah. Now, this is a chance not be sneezed at. Sister ship to the S.S. Segwun, the Wenonah sails out of Gravenhurst, with up to 200 people on board for special occasions (such as their Pirate Cruise, and Noah's Ark Adventure, weddings, and even casino cruises. Keep it in mind). She is wharfed behind a great weather station, one of those that is never wrong. If the anchor is hot, it's sunny. If it's wet, it's raining... you get the picture. The cruise included a talk by Sofie Andreou on how to leverage the power of the Internet, through all those funky social sites -- Facebook (are you following Bondi Village Resort? If not, please do :) ) Twitter. (we're out there, as BondiVillage -- tweet along with us!) Linkedin, Youtube and all the rest. 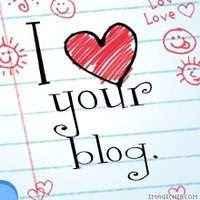 Including Blogs, whereupon one feels one is already preaching to the converted. There are so many sites out there now, it makes one tired just considering keeping up... The water shushing along the hull and the beautiful scenery outside the window kept us all going, however, while we learned the importance of connections. And speaking of connections, there was lots of time to re-connect with friends on this float down the lake, and to connect with new friends. I even met some folks who are Friends on Facebook, but whom I have never met face to face. That's a little spooky, actually... I also gave Matt, from Muskoka Lakes Winery, a hard sell on one of Napster's designs. We feel it would be perfect (should that read Purrrr-fect?) for a wine label on their lovely cranberry wines, especially for those times when you are "Feline Groovy". Perhaps a write-in campaign would help convince Matt? He has plans to come up and meet the artist, so it's looking good. We met some of the faces behind The Explorer's Edge (also known as RTO 12, a catchy name for the area you once knew and loved as Algonquin Park, Muskoka, Parry Sound and the Almaguin Highlands.) 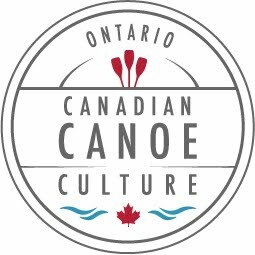 Now clumped together under the Provincial Tourism restructuring, the catchy new name, The Explorer's Edge, is designed to bring everyone dashing up here. Which you should do anyway, especially now, as the fall colours come towards their peak. So, many thanks to the MTMA for the afternoon. It was great good fun. Labels: MTMA. The Explorer's Edge. Sofie Andreou. S.S. Wenonah. Bondi Village. Lake of Bays. Tourism. Our summer guests will recognize Emilie, who comes on Tuesdays and offers wonderfully relaxing massages. She's very popular, and with good reason. She's also many faceted. For many years, Emilie has taught and enjoyed the art of bellydancing. It's not all about Arabian Nights, skimpy costumes and too much eye makeup -- this is a great physical workout for all ages, with a lot of whimsy and humour to go along with veils and fans. She is currently working up a gentle and entertaining dance program that she will be offering to provide to various institutions in the area, such as Seniors' residences. She'll also be very happy to offer it to any groups that are at Bondi, as well. It's about an hour or so in length, colourful, amusing, and just good fun to watch. We thought she was just great, and would have no hesitation in recommending this. Some of the routines are highly amusing, some are just plain mesmerizing. In addition to massage and belly dancing, Emilie also reads Tarot cards -- an activity she has provided to some of our guests who are looking for something a little different when they are here with a group. We'll happily connect you to her, if you're coming to Bondi and would like to add massage or an easy dance show to your list of activities! We are told that videos are the "thing"... that posts with videos get more views. So, here goes. We expect all of you to work with us and take this thing "viral." Said she, smiling. Bondi Maintenance Dept. leapt into action yesterday. The time had come for one of the old sheds to leave. Labels: demolition. Bondi village resort. Brian went on ahead, digging up the potatoes. David's task was to brush them clean, sort them and load them into baskets and boxes. Taffy thought she'd sign on as the Inspector. Her verdict? They were doing a wonderful job! For the plants that actually seemed to be what they were where they were supposed to be, the weather in the spring caused some grief. Still, we've had a great summer of fresh, delicious produce and we're still enjoying potatoes, beets, carrots, onions, tomatoes, squash, zucchinni. The corn is finished for the year, but the cornstalks will be decorating not just Bondi but many area businesses. Harvest time is well worth celebration. On Thursday afternoon, there was a sudden crack... then a shudder... than a crash. An enormous branch had broken off a basswood tree near Springside cottage, thundering to the ground. Luckily, it missed the cottage, and there was no-one nearby to leap nimbly out of the way. That however left the rest of the tree -- over 100' tall, unbalanced and with an ominous lean. Inspection of the broken region discovered some heartwood rot. Not good. We hate to lose our big trees. We hate even more to have them fall and cause damage, so there was nothing for it but to bring it down. Which sounds so simple, but isn't. The tree was anchored to the tractor, well out of the way on top of the rise, so tension could be applied to coax the tree to fall "our way". The thing is, the tree outweighs the tractor... so if things so wrong, they can do so fast. Brian has a favourite story of the chap who, thinking he'd save some money and Do It Himself, elected to take down a big maple leaning over his summer cottage. Attaching a rope to the ski boat, he directed his 'better half' to "hit it" when he yelled, and pull the tree harmlessly into the lake. The tree had other ideas, sliced the cottage neatly into a duplex and dragged the boat backwards up over the rocks and lawn. Armed with that mental image, the boys took plenty of precautions. And Brian does have extensive experience in felling timber. It went like clockwork. Thankfully. The giant came down with a rush of leaves and a crash of breaking branches and stretched up the hill toward the tractor. For well over a hundred feet... Big tree. The Maintenance Dept. took full advantage of the celebration that all they had to do was clean up the firewood and not rebuild the cottage to clamber about in the branches. "Don't think that was easy," Brian cautioned... The three of them spent the rest of the day cutting and hauling wood to clean up. A favourite of carvers, Brian kept some of the trunk for the local artisans. Basswood is a member of the genus Tilia -- with about 30 different species. In England, it is called a Lime (not related to the fruit) which is a variation on the name Linden -- which you will recognize from the famous Berlin Street Unter den Linden. German mythology considers it the 'tree of lovers'. Basswood can count age in centuries -- there's one in Gloucestershire that is 2000 years old. We haven't counted the rings on our beautiful lost tree, but at that height, it's been here a long long long time. In North America, these trees are called Basswood -- taking the name from the inner bark, or Bast, which can be stripped, soaked and woven into garments. Should you feel the need. Flowers of the basswood produce an excellent honey. The leaves and flowers have a long history of being used medicinally. The wood not only carves well but is favoured by makers of guitars for its acoustic properties. Beautiful, revered and valuable trees, we're going to miss that particular basswood at Springside. We're sorry to see it gone. Labels: basswood. Bondi Village Resort. In late June, Jacquie watched Momma Snapping Turtle lay eggs along the driveway to Jacquie's home on South Portage Road. Now, it's time... The eggs have hatched, and in one of Nature's miracles, the little guys are bustling off to the water's edge. Jacquie and Marci gave some of them a helping hand (and a ride in a shallow pan) to be sure that they made it safely across the roadbed and actually got into the water. 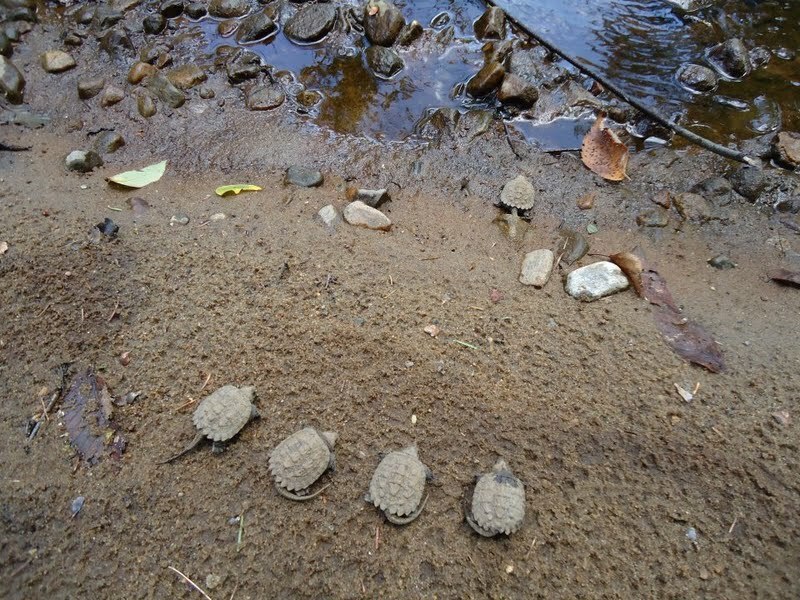 The gender of the baby turtles depends on the temperature in the nest. The easy way to remember is that Chicks are HOT and Dudes are COOL... Each snapper lays some 40 eggs in the nest in the spring. 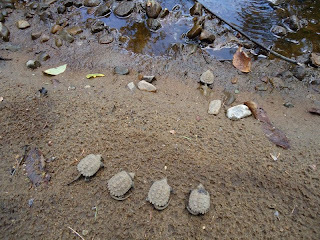 Predation by raccoons and foxes reduces those numbers considerably, so baby snappers need all the help they can get. Thanks for sharing the picture of the "kids" setting off, Jacquie! And thanks for being a Turtle Shepherd. Good job. We wish all these little guys -- and gals -- well. He was visiting with Syl and Kelly last week. 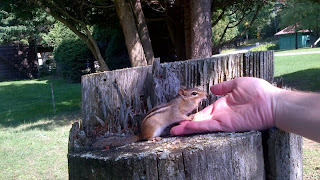 Most of the cottages have a resident chipmunk. Or two. And these little guys are just delightful. They are so sociable, and so darned cute, that they are among the most popular 'critters' around. There is something delightful about having one of these little chaps come sit on your hand for a snack. The view of the parking lot "Transition Zone" also helps put some perspective on the size of this competition. This is where the athletes get out of the water and onto their bikes -- and then get off their bikes and onto the run portion. It's a busy, happening sort of location. Which is why no parking is allowed for the duration of the competition. Vehicles are instead directed to Deerhurst's airstrip, and a shuttle bus moves the athletes back and forth. Good thing, too... because that airstrip is totally lined with cars! Thanks for providing such a great perspective Brian! It is a rare chance to get this kind of insight and overview of this big competition! Labels: Arrowhead Park; Muskoka Ironman 70.3; Muskoka Triathlon; Bondi Village Resort. Today was spectacularly sunny, t-shirt and swimsuit weather. Which does not mean that autumn is not drawing closer. The evidence is in the trees, where the leaves are just beginning to put on their autumn glory. Muskoka in the fall is breathtakingly lovely. You should be here. Labels: Muskoka. Fall Colours. Getaways in Ontario. Bondi Village Resort. Lake of Bays. Training the Terrain -- the hills here matter! 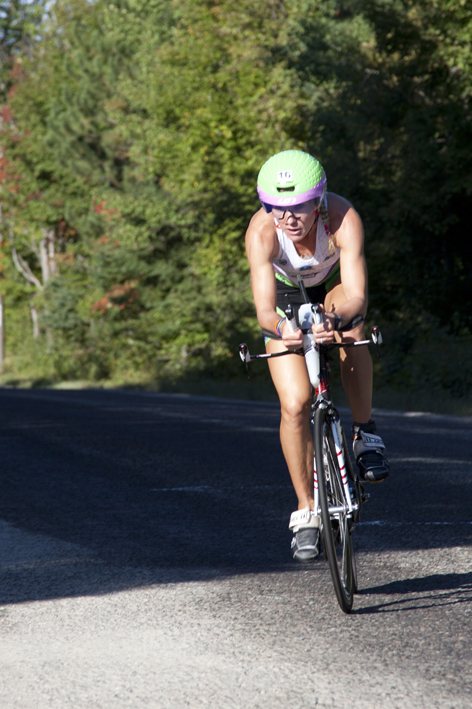 Congratulations to the participants in the Muskoka Ironman 70.3 triathlon that ran this Sunday. Over 1000 athletes took part. This photo, taken by Gord Duncan, was the front runner coming past our volunteer station at South Portage and Dwight Beach Road. The first riders are terribly focused -- not for them the cheery banter, they are through and gone almost before you see them. This is a great picture to demonstrate that! 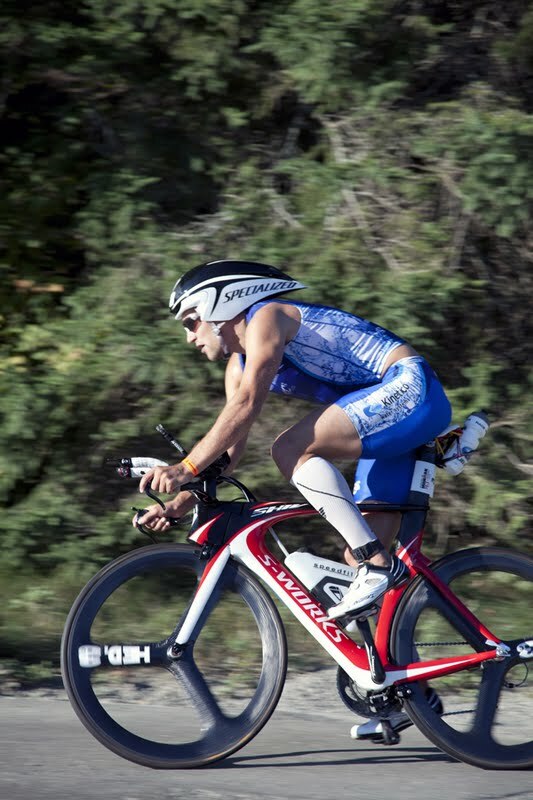 With spacious comfortable cottages, our own organic garden, and all the room you need to train, we've got what you need, whether you're tackling your first half-Ironman, or picking off yet another trophy. By the way -- see that high point of land just before you get into Dwight, the one that is the second highest point on that Elevation map? That's where we volunteer, at South Portage and Dwight Beach Road. It's known as Cain's Corners. There's the remains of an old historic Orange Lodge there, if you weren't biking too fast to notice. It really is about the longest climb, and (since we don't send you biking to the top of the Dorset Tower) it really is the highest point of land along the route. But it is just one hill of many... and this map really brings home why athletes need to train on the terrain. If it's hills you want, we've got 'em. 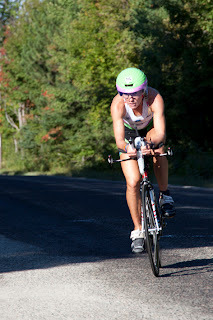 Labels: Ironman Muskoka training camps. Bondi Village. Last year we hiked with Diane's group to the Lookout. This year, we all walked down to Beaver Town -- or as we call it, Damalot. Taffy was on her first big hike with a group, and on the whole the puppy did well -- except for sideswiping Annette at one point, off into the tea bushes. Oops... She then got right into the action, wading out into the second of the three big beaver ponds at Damalot, looking of course for the Beaver himself. Other than the ripples Taffy produced, the ponds were mirror still. Along the way we found lots of serviceberry bushes adding touches of blue; winterberry painting the bushes red; wintergreen berries and bunchberries carpeting the forest floor along with the most beautiful ferns and mosses. We found lots of signs of Beavers at work. Jim from the Oxtongue Craft Cabin told us he can watch them at work damming up his culvert most evenings. That's our beavers... working hard to keep the 'damn' in Damage... Taffy did her best to illustrate the point that a dog who has fallen into the river, into the beaver pond and into what one hiker described as an "inkwell" of dark water (all in the name of finding out who lives there) is a happy dog. We came home along the Hidden Lake Trail, which winds through various eco-systems and skirts a gravel pit -- where there were plenty of wolf tracks on view. From there we ventured into the Black Spruce Bog that is Hidden Lake. That trail is always a wet one, you must step carefully, but the reward is the vegetation that thrives in those conditions. Coming back into our Pioneer Fields, we took a look at all that is left of Hyram Wilder's original log cabin, checked out the apple tree where the bear is building a bear nest as he pulls in branches to eat the apples, and returned to the resort along the Frisbee Golf Course. Labels: Bondi Village. Hiking Trails. Cross country ski trails. Probus. Muskoka. This weird wasp comes under the heading of Funky Critters. 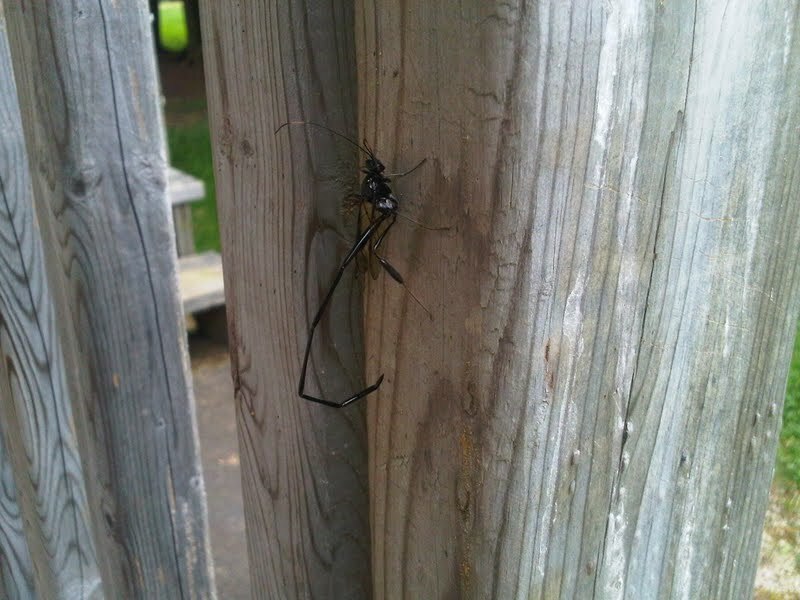 Syl sent us the picture of this female Pelecinid wasp hanging out at their cottage last week. 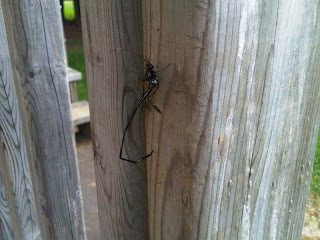 They are quite interesting bugs -- with an abdomen 5 times the length of the rest of the body. That abdomen comes in six segments. The Males are smaller, with swollen tip of abdomen; they are seldom seen. Hindwings of both sexes very short, about 1/3 length of forewings. It's that long long long body that gives them away. The female locates the grubs of May beetles in the forest soil, then stabs that long abdomen into the soil to deposit an egg on the grub. The egg then hatches, parasitizes the grub and pupates in the soil. The weird looking things feed on nectar and are harmless, but do rather look like they belong on an episode of Dr. Who. Solitary wasps, that is wasps that do not live in hives or colonies, they are generally felt to be beneficial because they do feed on more damaging insects in gardens. They are not all that commonly seen, so it was great to get this photo. Thanks Syl and Kelly! Labels: Pelecinid wasp. Narrow waisted solitary wasps. Bondi Village Resort. Autumn is here -- although with the weather just now it still feels a whole lot like high summer. Autum is a lovely time of year to decorate the doorways and driveways with fruits of the harvest. We were at Sandhill Nursery on the weekend -- their mountain of Pumpkins fairly shouted DECORATE!!!! But how to pick just one from that pile???? Labels: Sandhill nursery. Autumn. Bondi Village. Thanksgiving holidays Ontario. 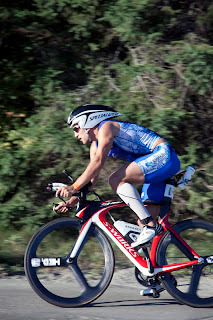 Ironman 70.3. John was the Story.